Mady G and JR Zuckerberg guide you through the basics of the LGBT+ world! for those already on their own journeys! J.R. Zuckerberg is a cartoonist, illustrator and craftsperson living in Brooklyn, NY. They grew up in the woods of northern Westchester and have always drawn inspiration from their observations of nature on a very small scale. 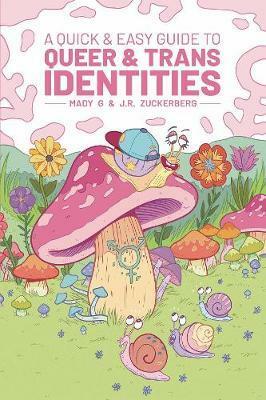 They are so excited to debut the microcosm of the Sproutlings in A Quick & Easy Guide to Queer & Trans Identities! Mady G. is a cartoonist and illustrator based in Los Angeles, CA. No stranger to wildlife and natural wonders, they spent most of their childhood exploring in the northeastern US and in southwestern Canada, surrounded by all kinds of flora and fauna. They are passionate about LGBT and human rights, especially the rights of transgender and gender non-conforming people, and hope to contribute to a more loving and less judgemental world.